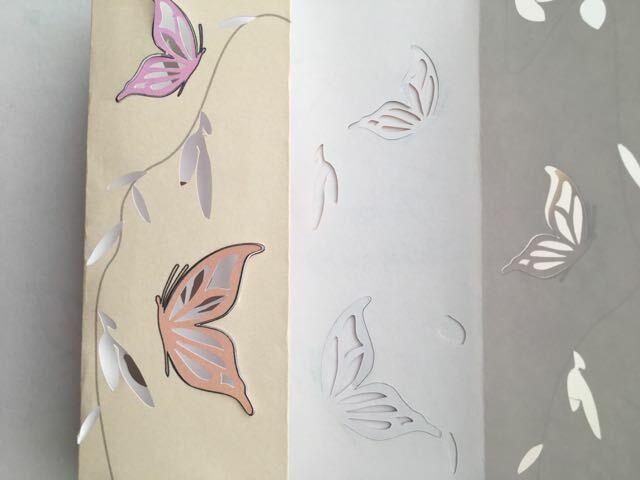 Three dimensional butterflies appear to flitter across the four walls of this Mother's Day lamp project. I’ve supplied the artwork and instructions for craft knife work as well as Silhouette Machine and SVG files. You just need to download and print out the one that suits you. Machine users should scroll to the bottom to get started on this page. The colorful card stock lamp slips over the light unit which offers several selections on its handy remote. You can even choose to have various colors fade or jump. The leaves and butterflies are illuminated and given a different feel by the color choice. 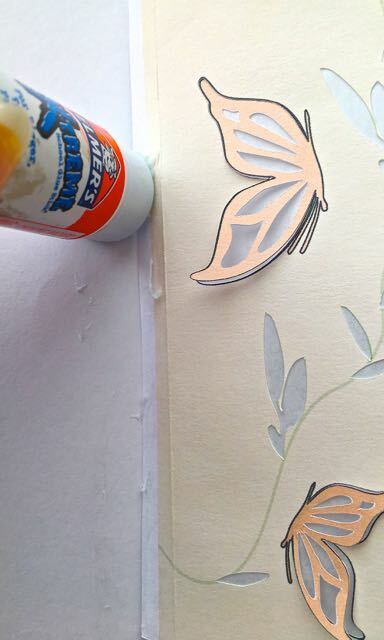 Lining the card stock with Velum or Parchment paper softens the light and gives the illusion of double wing butterflies on all panels of the lamp. Surprise a mom you know with this unique gift! step 1 - Cut four sheets of parchment or velum paper to measure 6.25" x 2 3/8". Set aside. step 2 - Print the template on card stock. With your craft knife, cut the sheet to size along the three black lines. Fold and crease the right edge at 5/8" with the unprinted sides facing each other, to form a flap. step 3 - Cut the butterfly wing shapes starting at the point where the wing meets the body. Do not cut through the body. step 4 - Cut the white shapes from the wings. Next, cut out all the leaf shapes. step 5 - Create two equal size panels by folding the entire sheet in half with the unprinted sides touching, and matching the cut end with the flap crease. step 6 - Turn the folded card stock into four equal size panels by folding the flap crease into the center and the cut end into the center. step 7 - Lay the card stock flat. Insert a business card behind each butterfly wing and fold it evenly forward. step 8 - Turn the sheet over. Apply glue to each panel. Avoid the cut out areas and butterfly wings. step 9 - Place a parchment sheet on the panel and press to adhere it. Repeat on all panels. step 10 - Apply glue to the printed side of the flap. step 11 - Overlap the cut end onto the flap and press to create the box shape. step 12 - Set the box over the light unit and use the remote to illuminate the project with the color of your choice. Step 2 - Print the template on card stock. Do not remove registration marks. Step 3 - Place the printed card stock on the cutting mat and "send" it to the Silhouette machine. Choose the "plain card stock" option in settings. Cut the design and weed out the pieces. Step 4 - Crease the card stock on the perforated line with the unprinted sides touching, to create a narrow flap. Follow steps 5 - 12 above. Note The Curio machine must have the 12" long tray and mat for this project.